Martin appeared on Show 304, recorded in Wellesley, MA, on March 26, 2015. 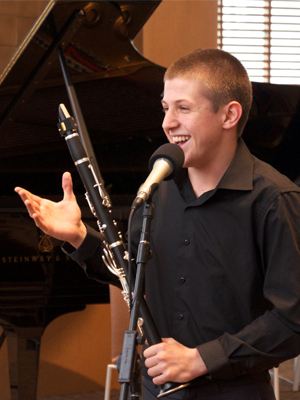 Martin Kocev (clarinet), 18, is from Valandovo, Macedonia, and he currently lives in Interlochen, Michigan. There he studies with Emil Khudyev at the Interlochen Arts Academy (IAA). In conjunction with his appearance on this show, Martin is a recipient of From the Top’s Jack Kent Cooke Young Artist Award. Martin has won numerous international competitions held in Serbia, Macedonia, and Bulgaria. He was a finalist in the 2013 IAA Concerto Competition, and he plays with the IAA orchestra, band, and clarinet quartet. Outside of music, Martin enjoys sports, particularly soccer. Martin is a Jack Kent Cooke Young Artist.